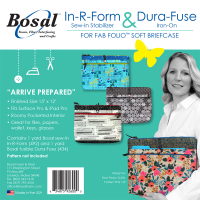 The latest from Bosal Foam & Fiber is packaged interfacings especially for use with Eazy Peazy’s Fab Folio (EPQ159) pattern. For customers it's a perfect grab-and-go! Each package contains Bosal In-R-Form and Dura-Fuse. Fab Folio patterns are sold separately. While at Spring Market check out the fabulous Fab Folio samples in the booths of Bosal Foam & Fiber and Moda/United Notion. 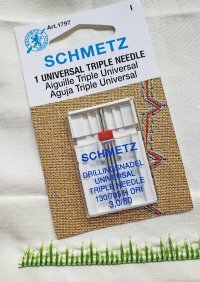 With a Schmetz Triple Needle everyone will find it easy to create beautiful and unique fancy stitches that will enhance their projects. Shown is a trial of "grass"…such fun for the home sewer and quilter.